I thought about titling this post "Two Races in One" due to the Jeckyl and Hyde nature of the days weather but we'll get to that later. As I posted in my preview, I was hopeful for good weather and conditions and that my recovery from Umstead would allow me a shot at a course pr. After emerging from my tent at 4:30 am before the start it appeared that at least the weather would cooperate. It was in the upper 40's, clear skies with a million stars overhead and a forecast of upper 60's with only 10% chance of rain. Oh yeah ! With about 10 minutes to go I headed over to the starting line eager to began the day's journey. I lined up with Jenn the Ultra Angel but I knew we probably would not be spending much time together on this day. I had the splits from each aid station from my 2007 course pr written on my arm so I could quickly tell if I was on pace for a good run. Promptly at 5:30 am after singing the National Anthem and a prayer from David Horton we headed up the gravel road in the darkness for the first 2.6 miles to aid station one at Overstreet Falls. The road is flat for the first quarter mile but then gradually begins to climb becoming ever steeper as we ascend to the trailhead. I tried to run as much as possible until the gradient became too steep and then settled in to a strong powerwalk. It's really hard to judge how you feel and how the pace is going on the section so I was very happy when I passed by the aid station and I was exactly to the second for that first split compared to 07, arriving in 42:07. I didn't need anything so I immediately started up the steep and rocky trail that would take us to the top of Onion Mt. Within moments I heard a young lady behind me ask how if I had run this race before. I replied that yes, this was my 6th time racing. She then said this was her first ultra and would I mind if she paced off of me. Without looking back I told her that she was welcome to run with me as long as she wanted. It's a good thing I enjoy talking and running with people because she sure was full of questions about not only this race and the course but running in general. After a few minutes I could tell she seemed to be breathing pretty hard and my initial thoughts were that she was in way over her head and I would be alone again before too long but she seemed like a really nice young lady and I was glad to have the company. By now the sun was rising and I was pointing out some of my favorite views and describing the next section of the course. I couldn't feel much better at this point if I had to and in these early miles I was feeling confident of having a good day. As we ran along on the grassy Glenwood horse trail I felt I was making good time. We were having a great conversation interrupted occasionally as I would pass or be passed by one of the many friends out on the course. This is a longer than advertised section and I was explaining "Horton Miles" to her when we finally came within sight of the aid station at Reed Creek. Leah seemed to be in a rhythm now and running well so for the first time I glanced back to see what she looked like since it seemed we were going to be together for awhile. At this point it was still all about me and my quest for the course pr so I was in and out of the aid station quickly but she was determined to be my shadow so she followed me out while stuffing some food in her mouth. I was almost 4 minutes behind pace now which was a bit disappointing but I still felt good so the quest for the pr was still on. We began the climb up to the top of Apple Orchard Mt still chatting away. She must have had a hundred questions about everything and I was happy to answer them and encourage her. She told me she had only run one marathon before so now I was really thinking she was in for a rude awakening before long. By now the day was gorgeous with the temps rising but still very comfortable or in a word, perfect for the race. We made a good effort going up to the parkway and then ran strong all the way down to Sunset Fields. I felt great and she was still my shadow matching me step for step as we came into the aid station. I lost yet another 2 minutes in that section so once again I was in and out very quickly with Leah right behind me. As we once again entered the rocky single track I told her my story of "dancing" through the rocks and in a few minutes she said yep, it looked like I was dancing. Well she was doing a fine job of staying right with me despite her lack of experience. The questions continued and I continued to describe the course as we moved along finally reaching one of my favorite sections of the course where the trail parallels the whitewater creek down to the Cornelius Creek Aid Station. This section is so beautiful and every year I wish I could spend hours slowly walking down to the creek, playing in it and taking pictures but even taking a glance is risky business on this rocky downhill trail. We enjoyed crossing the creek and cooling off the feet and soon enough we were into the aid station. I saw my friend Charles West there and he asked me how I was doing on time. Well, I had lost yet another 4 minutes despite feeling great and running well .I guess feeling good is a lot slower when your 5 years older at my age. I was now down 10 minutes and a pr was out of the question but I still felt great so I was going to keep going as fast as possible and still have a shot at a decent time and maybe my 2nd best at least. The next mile or so is a flat gravel road so I was running pretty hard hoping to make some time. For the first time Leah was starting to mention that her legs were getting really sore and tired so I told her that was completely normal after that long downhill pounding we had just finished. I could sense that she wanted to walk some but I told her there would be a chance for a little breather when we hit the White Tail trail. She did really like that section and before long we were at the Colon Hollow aid station where once again I lost 2 minutes off the pr. It was soon after leaving the aid station that I think I had unknowingly began to lollygag a little. We were enjoying a great conversation and she was still peppering me with questions. We enjoyed a good laugh over the joke of how I became "Ultraman" I told her all about my Angels and when she asked if I'd ever run Boston I got a bit emotional as I told her Karla's story. 6 years now and every time I tell it to someone new I get choked up. About this time she confided to me that she didn't ever finish that marathon she had ran had but dropped out at mile 21 with heat exhaustion. About this time that we heard the thunder and in just a few minutes the rain began to fall along with the temperature. I could tell she was tired but was still in great spirits and I guess it was somewhere about this time that my focus went from running fast to seeing to it that Leah made it to the finish. I began to run and told her we needed to keep it going now. Within just minutes it seemed my hands began freezing and before long we were soaking wet. We finally we made it into Cornelius Creek for the 2nd time losing a whopping 11 more minutes off my goal pace but by now it didn't matter. I started heading back towards the bridge and was waiting for Leah. She lost sight of me and thought I had left her behind but I wasn't going to do that to her. Not now with just the last big climb to go. Are we there yet? Are we there yet? Are we there yet? Apparently someone had told her about the steps and how tough they were but since she was not familiar with the course my description of where they were was not helping her too much. We began the steady climb trying to run a little bit while we still could before it got too steep and rocky. It was raining pretty hard now and the higher we climbed the colder it got and I was beginning to worry about hypothermia, not only for me but especially for her because she was just wearing a racing singlet over her sports bra so I know she had to be cold. The trail was getting very muddy and treacherous in spots now and I kept looking back to make sure she was still right behind me. We finally made it to the falls and I would have loved to have taken some time to enjoy and take some pictures but I knew we had to keep moving as the conditions continued to deteriorate. Ok Leah, now here are the steps ! See, they aren't that bad and look at that beautiful view ! Yes the worst is over but there is still a lot of climbing to go before we reach the top. Well, normally the worst is over but today it just kept getting colder and getting windier the higher up the mountain we climbed and to make matters worse the dirt had become a mud with the consistency of chocolate pudding making for some slow slippery progress. Leah was still right there but she mentioned she was getting a little dizzy feeling. I knew that was an early sign of hypothermia as well as low blood sugar but all I could do was keep climbing and encouraging her along and that we were almost to the top. Surprisingly we made it to the top under those conditions only 6 minutes slower than on my pr day. I think the cold was really motivating me to push it so we could head down to hopefully warmer temperatures. The rain had stopped but the wind was blowing and I was freezing so a quick gel and some coke and time to roll ! We had a slight downhill for 3/4 mile and then the last little climb for about half a mile back to the top of Onion Mt. I told her that now it really was all downhill and she had it made. About that time there was a bright flash of lightning with a quick crash of thunder as another storm hit right on tip of us. Leah flinched and asked if we were going to be alright. I told her, well the only thing we can do about it right now is to run and pray. She took me at my word and the girl took off ! The trail going down here had turned into a river of mud covering the rocks beneath. I was trying to be careful but still trying to keep up. She looked back a couple of times and asked if I was alright and I assured her I was coming, just trying not to get hurt. She opened up about a hundred yard gap on me but we both passed several people that were not even trying to run on the treacherous trail. I was finally able to close the gap and was just a few steps behind as we came off the trail and onto the steep downhill gravel road. I had been needing to pee for a long time so I finally stepped off to the side thinking I would have no problem catching up to her now that I didn't have to worry about the footing. Boy was I wrong. Within a few minutes she was out of sight and I was running just about as hard as I could. After a few minutes a man caught up to me that was from Raleigh and I fell in pace with him. Finally in a few minutes I spotted Leah up ahead and could tell I was closing the gap. Just past the mile to go mark I caught up to her. She was happy to see me and told me to go on ahead but I slowed down and told her, no were finishing this thing together. I thought that feeling as good as I did that I would be disappointed with the time but it turned out to be a very enjoyable day thanks to sharing it with this 19 year old young lady from Va. Tech. Despite the rough conditions over the last 3 hours she never whined or complained and I was so proud of her gutsy performance. This rookie exhibited all the necessary attributes to be an Ultraman's angel for sure. It was truly a pleasure to meet her and spend the day on the trail with her and I know that there is nothing she won't be able to do if she puts her mind to it. 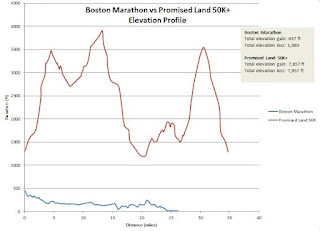 Saw this elevation comparison for Promise land and Boston. 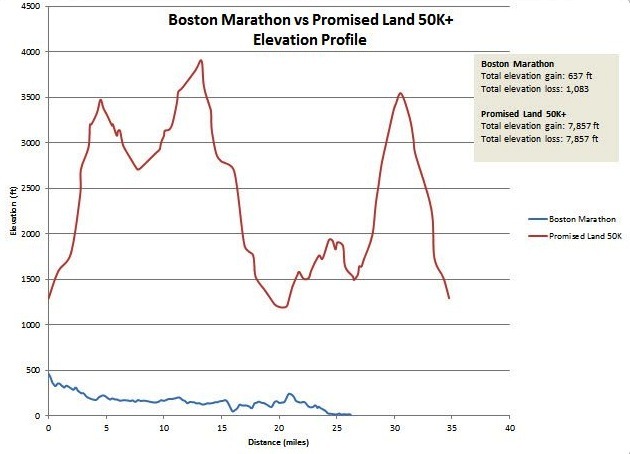 this kind of puts it in perspective next time someone says Boston is a "tough " course. This is a great report and I'm sure Leah was very thankful to have you help her through it! Enjoyed reading your blog here Joey. I'm a team member at CapFit and briefly spoke with awile back there. I've kept up with your ultra blogging adventures since. You're certainly an inspiration. My daughter graduated Libertyin 2010 and was a student of Dr. Horton's. She loved the way he inspired her and challenged her to go beyond her comfort zone. Having completed her 1st marathon in Jan. 2011 she has now been inspired by several friends who just ran the Promise Land 50K with you all and who were also students of Dr. Horton. She and I both enjoy trail running much more than roads and are seriously considering running this as our 1st ultra next year. Ronnie, thanks for reading. that's cool to know your daughter was a Horton student. I love how he has inspired so many young people to get into the sport. Hey Joey, it's Duran. I'm SO glad I found your blog on Horton's site. I'm going to be up at Falls Lake this Saturday and figured I'd go out for a early, early run while I'm there. Where's would I get info about the where the trailhead is? Trail markings, etc.? I'd likely be running PRETTY early; what should my parking plan be?